The signature shape of corrugated metal is the key to its durable, yet lightweight, characteristics which make it the perfect choice for many construction projects. In the same way that the paper that makes up a cardboard box is strengthened by the sheet of wavy paper sandwiched between two flat layers, sheets of metal can be made stronger by corrugating, or folding the material to make ridges and grooves. The wavy construction leads to increased strength over a shorter surface area. This special corrugated shape adds strength to lightweight materials. This means that a lightweight metal like aluminum, which may otherwise be too flimsy, can be made sturdy enough to withhold years of beating in all kinds of weather. While this type of roofing has traditionally been used in commercial, industrial, and farming settings, residential homeowners have recently increased the demand for the product. Additional improvements such as galvanized metal, which protects it against corrosion and rust, has allowed this sheet metal roofing to evolve from a limited material into one of the most sought-after roofing materials available. Corrugated metal roofing is most commonly available in copper, aluminum and stainless steel. If you were to get a roofing quote with these different materials, you would most likely find that these three metals differ in appearance, cost and durability. Corrugated aluminum roofing is at the top of the list in terms of both value and quality. For this reason, aluminum is preferred in residential settings. As an added bonus, aluminum roofing is durable, rust resistance without the need for additional coating, better looking, and can take on different paint colors. Corrugated steel roofing sheets come with a built-in, natural gray finish to them. While this may work in some instances, many owners wishing to change the initial color of the material may run into problems. Corrugated steel roofing is also more expensive than the other two most common alternatives. Another alternative that has not been talked about much is corrugated copper roofing, which while easy to install and naturally resistant to rust, usually turns out to be the most expensive option. 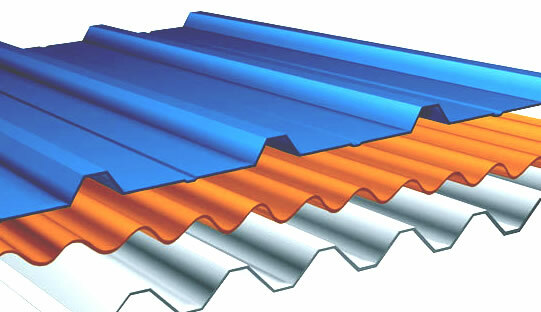 In rare occasions, metal alloys are used to make corrugated sheet roofing, however the cost of alloys makes this type of roofing financially prohibitive. With all the properties that metals have, it is not uncommon for a metal roof to last for up to 100 years. It would make sense that a roof of this material would be able to withstand extreme weather conditions, including heat waves, snowstorms, hurricanes, and even hail storms. The most modern galvanized metal roofing also has fire resistant properties, and contrary to popular belief, is your safest option in areas where lightning strikes are common. Those who are concerned with being environmentally friendly would be happy to know that corrugated roofing is completely recyclable. In warmer climates, metal roofing reflects the sun and reduces air-conditioning bills, while in cooler climates it can warm underlying areas. Its lightweight build reduces stress on the underlying walls of buildings, and so doesn't require much structural support. When installed properly, leaks should never be a problem like they are with traditional roofing shingles.